I own quite a few books from YWAM Publishing. I can't help it, they are great. Until recently they have all been from the Christian Heroes: Then & Now collection, but recently my history loving family has discovered the Heroes of History collection. Yes, we just got to read, review and add Ronald Reagan to our collection! Heroes of History -Ronald Reagan: Destiny at His Side is a 224 page paperback about Ronald Reagan, our 40th president. But it is a book about so much more. Beginning with his early days growing up under an alcoholic father, authors Janet and Geoff Benge tell of a young man who was a problem solver, determined, caring, and hard working. From his childhood, to his early days as an actor, to his years as President, this wonderful book paints the picture of what a true hero looks like. Despite the fact that his family moved multiple times during his childhood and making new friends was difficult at first, Ronald, known as 'Dutch" by those who knew him, was well liked by most who met him and prone to success in most of what he did. The intended reading level is about ages 10 and up, but our whole family enjoys these books and they can easily be used for family read-alouds for families with younger children. As always, my kids grabbed these books as soon as they arrived! (As Crew leadership, we actually received several!) It is no surprise that Colby, age 9, chose Ronald Reagan. For the past 6 months Colby has become slightly obsessed with presidents. Although my original intent was to use this book as a family read along, that has yet to happen since he finished it on his own in about a week. The reading is a little heavy for a nine year old, but because of the subject matter Colby plowed through it, determined to get to the "president part." Luckily for me, the first chapter is a attention getter with a scene from the assassination attempt on President's Reagan's life. The action packed chapter (which ends in a cliff hanger) was enough motivation to keep our 9 year old reading, although he did get a little lost in a few sections. He said the school parts were boring. 9 year old boy- go figure! That's where the Unit Study Guides got put to use! Doing research for the timeline! Each YWAM book has a Downloadable Unit Study Guide. The Ronald Reagan study guide is divided into two parts. The first part is 82 pages long and is a wealth of information. It includes writing exercises, hands on projects, historical information, and even geography ideas. There are also 6 questions for each chapter, the first 3 targeting younger students while the the last 3 are more difficult. For further study, a biography of related resources is included that covers books, magazines, movies, and more. The second part has four downloadable sheets- a Ronald Reagan summary sheet, two maps, and a timeline. Also included is a 24 page overview guide for homeschool parents on how to better use the book and unit study together. Guides for small groups and classroom use are also on the downloadable PDF. Because we are using this book as merely a fun read and a good source of information, we have used the study guide pretty loosely, but because Colby read the book alone it is the perfect help for me to know what he understood and what he did not. By reading the questions for several chapters at a time, we were able to discuss things he enjoyed and clear up any things he did not understand. He did LOVE doing the time line, as this boy has a head filled with dates and facts. It amazes me. If we were doing an actual unit study with the YWAM books, I would do things a bit differently. For younger kids, I would read a chapter at a time together and then answer the corresponding questions orally. Older students, upper middle school and up, I would have read independently and then answer questions in their own notebook. To make it a compete unit study, I would personally require two to four additional projects to be done, as well as have my child read an additional book from the resource list and do a short book report. Maybe a reward at the end for a job well done could be to watch a movie staring Ronald Reagan! I know it sounds like a lot, but that is the beauty of these study guides. You are the teacher and you can pick what works for you and what doesn't! If you want to use these amazing books for your literature OR history unit, go for it! There is plenty of information there to get you started. If you just want to enjoy a summer read (or spring, fall, or winter) you can do that too! Either way, I know you are going to enjoy YWAM's Heroes of History and Christian Heroes: Then & Now. I know some of you have already gotten to this room when you did your entry, but I waited on mine AND, until recently, we still had need for slightly heavier jackets and such. If you are ahead of us, good for you! Take this week to either sit back and gloat or go back and finish up an unfinished project! Or how about revisit your kitchen and see how you are keeping it up! Remember, we can not do things once and expect them to remain perfect. There is always need for maintenance- at least in my house. So, yes, I did actually think I was a bit behind on cleaning out this hall closet. I mean, summer is here right? Well, maybe in your neck of the woods, but here in Nebraska someone did not get the memo. This past week has been COLD ya'll. Ok, not like snow weather, but definitely chilly! The reality is that I am not as behind as I thought I was. Warmer temps have finally hit and I think they are here to stay. Luckily for me, this was a pretty easy week despite the fact that until recently we had this tiny space pretty packed! How many coats does one really need per season??! So first things are first. Yep, you guessed it - pull it all out. Now that we have a new mud room, this space is used mostly for coats not currently being used, a space for guest coats when they come, the vacuum, and a few containers for seasonal decorations! After we determined what made the cut and what didn't, it was time to wash! Yes, you need to do this! After playing in the snow and such all winter, trust me, that stuff is grimy at best! Coats get washed too, or sent to the cleaners if needed. That way they are clean and ready to go for the next season. To make our lives a little less crazy, we do store our winter stuff in the garage during the off season, except for the hats, scarves, and gloves that stay in baskets in our new mudroom. Just works for us, but you decide what works for you! A note about these containers. Two are marked for Easter and hold our...wait for it...Easter decorations. One is marked Christmas and just holds a few little things that I can take out easily before I manage to pull out the big boxes. There used to be a Valentines box as well, but I managed to give that up two years ago. I do not mean to be a party pooper, really I do not, but I am just past the "decorate for every holiday" stage. Call me lazy, but I just don't have the time nor the energy. See, it isn't laziness, it is just plain I'm too old and and have no energy! ;) I also realized that by unstacking them and making them easier to access there was a better likelihood of things getting put back into them. I wiped out the closet and the rest went back in. And yes, a few heavier coats are still there just in case. I am no dummy! Not a very exciting week, I admit, but one we all should be able to get done easily! Some weeks we need a quieter project, right? You can thank me later. Or just send chocolate now! Let's see how you did last week! By leaving pictures each week on our FB page of your progress you are entered into a drawing for wonderful prizes from our friends at 621 Gifts and Redeemed as well as a fun box of goodies from us! Remember, one week at a time - every little step is progress. Keep what you need and love, pass the rest on. You will be glad you did! See 'ya back here next week! Until then, happy cleaning! If you follow me on any social media, and if you don't - come join us, (Links at the bottom of the page!) 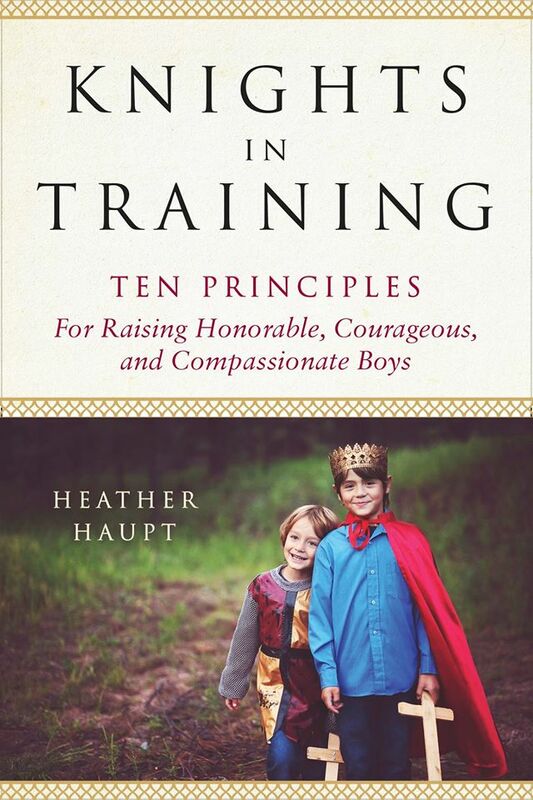 you know that I have begun reading a new book called Knights in Training, written by Heather Haupt. Well, actually I am almost finished with it. A review of it will be posted next Friday but today I wanted to share with you a few quick thoughts from me and a few Q and A's from Heather. 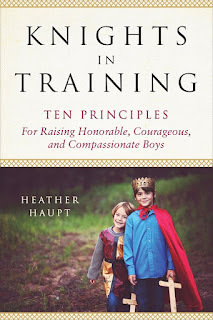 Heather Haupt is the mother of three knights-in-training and a spunky little princess. She wants to be intentional during these years of parenting and raise children who will make a difference in this world. 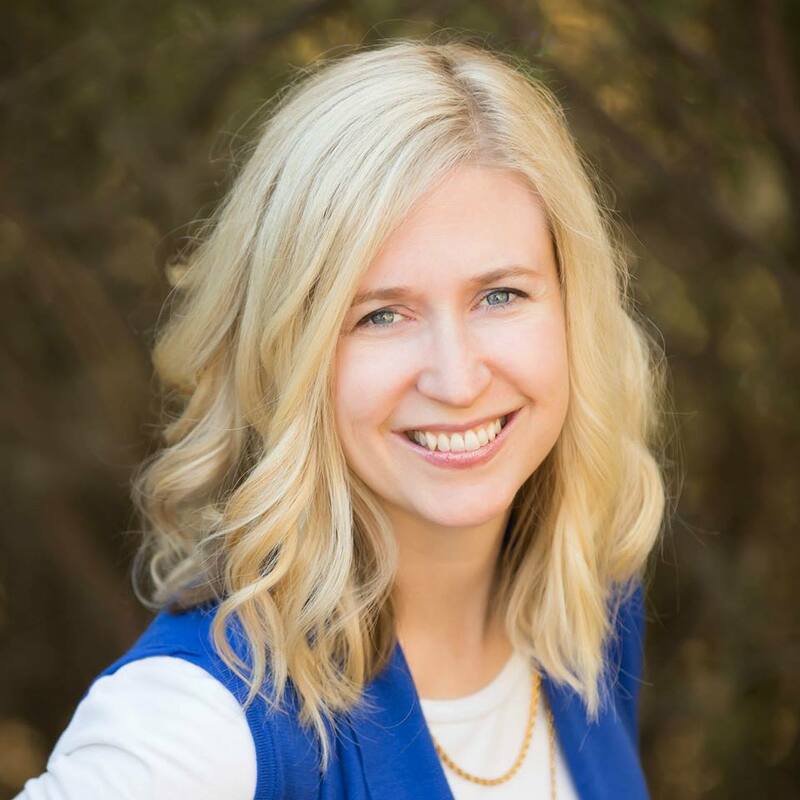 Heather is an educator, writer, and popular speaker. Recognizing the brevity of childhood and the power of a parent’s influence, she encourages and equips parents towards intentional parenting, pursuing God, and delighting in the adventure of learning. She is the author of Knights-in-Training: Ten Principles for Raising Honorable, Courageous, and Compassionate Boys as well as The Ultimate Guide to Brain Breaks. She writes at www.heatherhaupt.com. Friends, let me tell you, Heather is a bold writer and a champion for boys and families. It is obvious from page one of her book to the very end that this is where her heart is. In Knights in Training she calls families to "inspire today's generation of young boys to pursue honor, courage, and compassion." 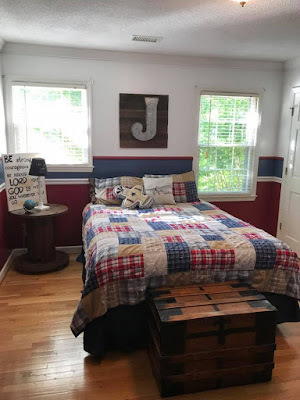 She is encouraging moms and dads to issue a Chivalry challenge to their boys, and she is equipping her readers with creative ideas to help them along the way. It only took me one chapter to know that this was a movement I wanted to be in on and our two boys quickly gathered all the books we had on the subject! Since then, well, things have been busy around here. I can't wait to share some of that with you next week in our full review. Until then, I want to give you a quick glance at the background behind this book and share with you details on how to buy it, and possibly win a copy! What was your main goal in writing Knights in Training? 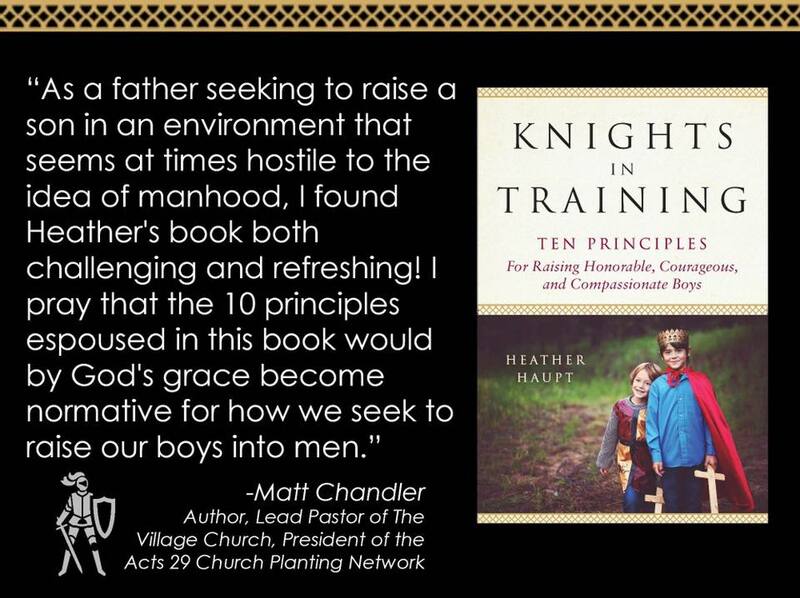 I wrote Knights in Training to help parents tap into the heart of their boys and utilize a boy’s inner dreams and drives to propel them into a future of meaning and purpose. We all love our kids and want to be purposeful during this season of childhood – enjoying the little moments as well as preparing them to succeed in life, but sometimes in the busyness of life we lose sight of HOW to make that happen. My goal here is to provide a common language and a roadmap for this exciting journey of boyhood so that one boy and one family at a time, we can restore civility and courageous compassion to our communities. Which part of researching Knights in Training was the most personally interesting to you? I’m a history buff, so delving into some of the primary documents and really discovering how this idea of chivalry took shape and force during the middle ages was fascinating to me. Delving into the past also reminded me that there is nothing new under the sun. We see the same challenges with human nature, our bent to wander from the Lord, from the right path as well as the importance of inspiration and ideals in captivating our imagination and calling us back to the way we ought to go. When we step into the past, we discover that young men in the middle ages struggled with choosing the easy path, that younger sons in the nobility lost sight of their purpose and meaning and were tempted to take the easy path of living a life of listlessness and apathy and yet how deep down they all wanted to find purpose and meaning. 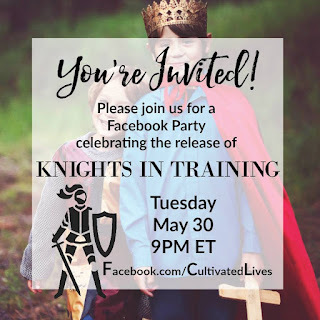 What inspired you to write Knights in Training? 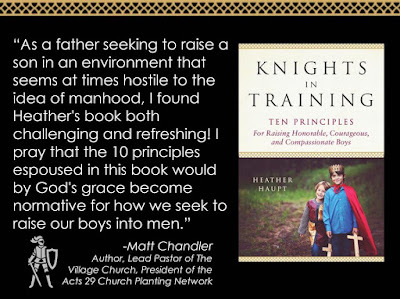 Coming up with the idea for knight training was birthed out of a desire to be intentional in raising my boys. When I saw that their love for everything battle meshed well with my discover that chivalry was far more than how a man treats a woman. I knew I wanted to embark on a season of knight training and pursuing living by this code that for the knight’s of old was an entire way of living. Little did I realize that embarking on this initial season of knight training would alter the way we viewed our role as parents and forever shape the way my boys viewed these years of childhood. 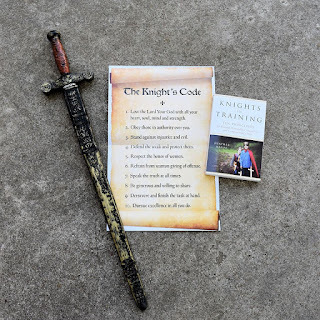 I wrote the book to really flesh out what it can look like to celebrate boys for who they are and cast a vision for a life of adventure embodying the spirit of a modern-day knight. Boys are getting a bad rap these days. Part of that stems from how we approach educating boys as well as a lack of understanding and appreciation for what makes them unique. Our world needs good men and my aim with this book is to strengthen the resolve and equip parents to reach their boys by appreciating who they are and how they are wired as well as inspire them to become the men they are meant to become. Right now Knights in Training can be pre-ordered and you won't have too long to wait because it is almost release time! 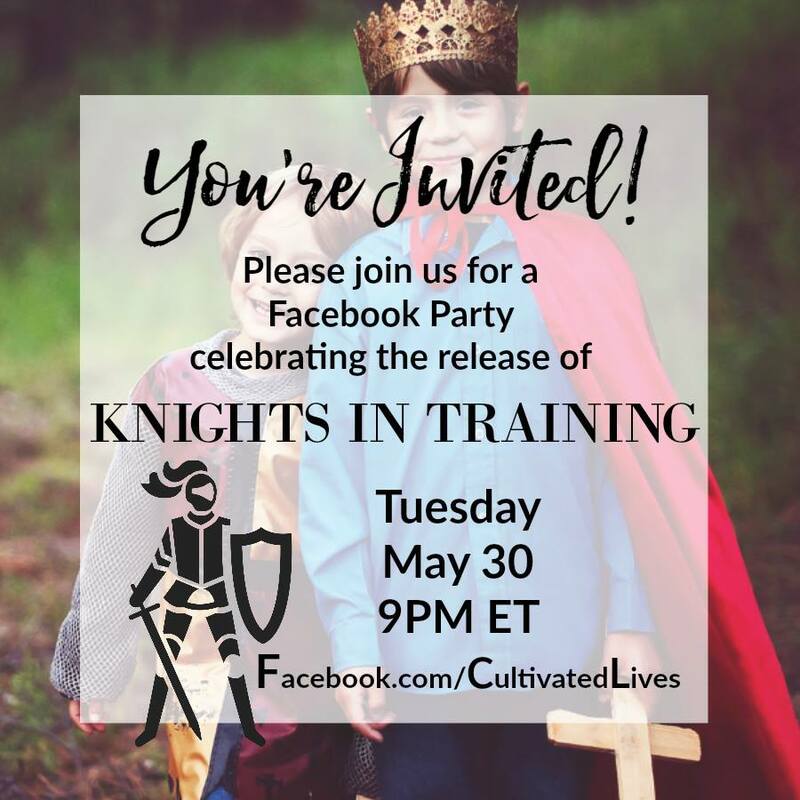 A Knights in Training Book Release party is scheduled for next week, Tuesday, May 30 from 9-11pm (EDT). Be sure to join us for a chance to win some fun prizes and hear more from Heather! See you back next week for our full review on this awesome book! Ever wonder what the difference is between the two? It has been weighing on me for months and this post has been in the works for almost as long. I may be rambling, but hear me out. In the past few years, I have been pushed to my limits. My idea of my limits of course, not God's. But there have been some struggles. We had an unexpected deployment with short notice and the struggles that come with that, as well as some tough personal issues for our family. No more or less than others, I am sure, but personally just a hard time. In those times I had many people reach out to us trying to help. Some were helpful, some not. At all. But in both cases, they often spoke the same words. 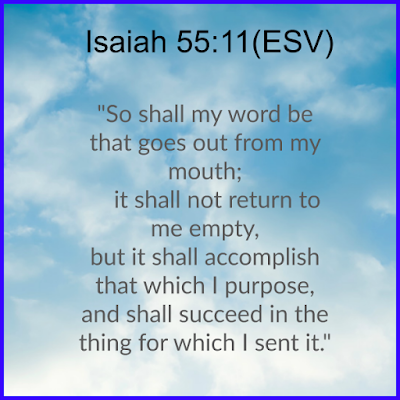 God's Words. It got me wondering why some were such a comfort and others seemed to just about push me off the edge of the cliff I was standing way too close to at times. It came down to this for me- TRUTH or TRITE. Truth- Truth is that which corresponds to reality. 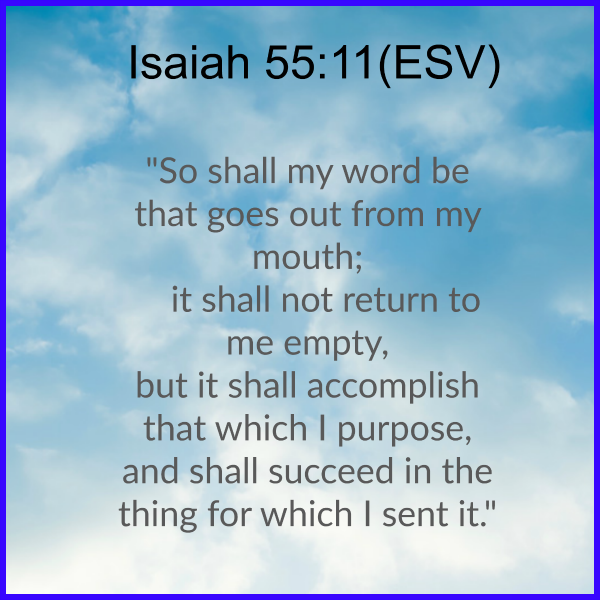 Now do not get me wrong, God's Word is ALWAYS truth. Always! And it will not come back to us void. See, I think it comes down to the heart of the person sharing. Again, you can argue that is hard to know, but let's face it, it is usually pretty obvious. When someone cares, you know it. When someone hurts like you hurt, you feel it. When someone grieves like you grieve, you see it. And sometimes we just need to sit beside someone and hold their hand. And just be quiet. It can make all the difference between truth or trite. Oh friends, let's be people who CARE, who enter into hard places with our friends and refuse to leave until they do as well, and who share God's word in love and out of love! It makes a difference! I know, I know, messy and Art just go together, right? I mean really, that is why I do not do a lot of art projects in my house these days with the youngest. I used to be a fun mom- think paint, and glitter and sequins and glue. Lots of glue. But now I am old and tired and not a messy mom type anymore. And that is why Thin Stix 6 pk of Classic Colors from The Pencil Grip, Inc. is now my favorite art supply. Who are we kidding, It is just about my ONLY art supply. We reviewed Kwik Stix a while back and had a fun time making welcome home posters for my husband. At the time, lots of our things were packed up or at our other house and the timing for that review was perfect. This time around we had no excuse to need to use them other than they are just plain fun! So you may be saying, "but I thought The Pencil Grip, Inc. had fancy pencil grips for kids!" Yes, they do! And if you have never used them before I would suggest you give them a try. Kids think they are so cool, and they really do help younger kids grip a pencil as well as fix bad grip problems in kids. The company also carries many therapeutic toys and gadgets as well, but one of their newest and coolest products in my opinion is their solid tempura paints. Yes! You read that right! SOLID! No water or paintbrushes needed. Sold already aren't you!? They are also toxic free and dry in about 90 seconds. They do not crack when dry and are versatile enough to use on paper, canvas, wood and more. What else could you ask for? Did I mention mess free?! OK, I think you get the point. You just twist off the cap and use these paints like a crayon or marker. When they run low, you just twist from the bottom for more. The newer Thin Stix are not as bulky and allow for finer coloring skills, therefore I would suspect many older kids will enjoy them more than the original size. 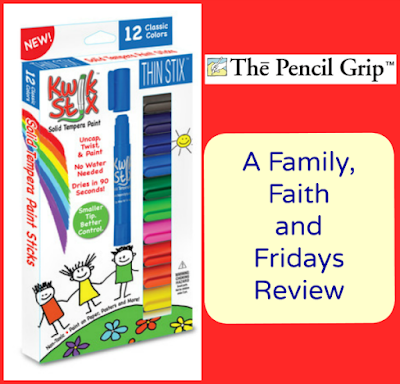 I think the original Kwik Stix are better suited for preschool and elementary age kids and their chubby hands. I have a messy 9 year old boy. Painting with him in the past has not been overly fun for me. In fact, we stopped doing it to save my sanity. While I obviously do not have to worry about him eating paint, I know that is not true for some of you with really young kids, I do have to worry about paint everywhere. He's a boy after all. For now my son has just been using the Thin Stix for simple projects in his spare time, but he has asked if we can get some of the "cool" colors to use as well. Metalix and Neon are on our list! In the summer when we have more time in our day for fun things like art, the Thin Stix paints are going to get even more of a workout. And this mess free mom is going to just sit back and watch the fun! Welcome back! 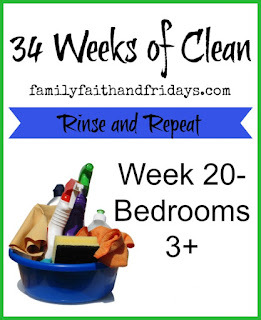 By now you have had a week to get a start on any bedrooms in your house, excluding the Master. That was done in week 15, right? Remember, everyone's bedroom situation looks different but the basics are the same. Since we tackled our girls' rooms last week, we are now moving to the boys. This was a slightly harder week for me for obvious reasons. 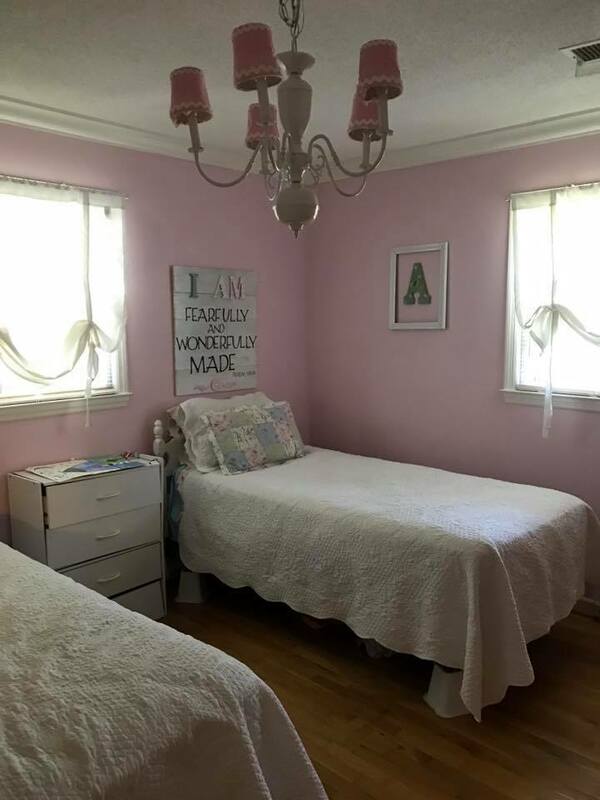 Your assignment is to finish any bedrooms left in your house. While stuff is still off, move furniture away from walls so you can wipe down baseboards and vacuum around all edges. Replace furniture or rearrange while you have the chance! Is it just me or is deep cleaning just an excuse to rearrange? Again! Put things back, but try to eliminate half. 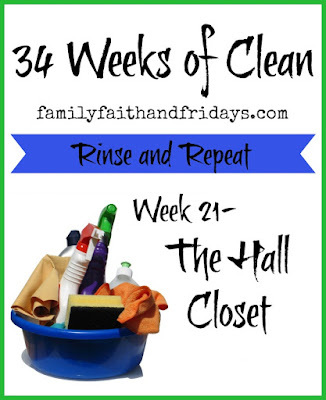 Remember- the more STUFF your kids have, the harder it is for them to keep it organized! For younger kids this is a good time to weed through the toys. We talked about toys last week, but here are a few more points to consider. We have found that when we deep clean, we uncover things that need to be tossed. Whether old, extra, or broken, our kids tend to hold on to whatever we let them. We try to organize and evaluate on a regular basis. This is NOT a one time job, especially in our kids' rooms! Yes, those are Legos. Yes, it is obnoxious! Deep cleaning is also a time to fix things. We had a bookshelf that had a bad leg. My "little fix" turned into a three hour project but my husband rocks and got it done. When your parents won't get out of your room, you hide on the floor of your sister's room and read a book for a few hours! They may not be pottery barn, but they are pretty good, if I say so myself. This week I want to leave you with a few thoughts and some encouragement. If you have not joined us yet, it is NEVER too late to start. I say that in all seriousness. Just start. You CAN do this, I know you can! If you are behind, don't let discouragement keep you from the finish line. We all have to do life and sometimes things get in the middle of our best laid plans. That is OK. What is more important is that we get back on the horse and keep riding! I hope you can hear me cheering for you to keep riding. Let me know how you did last week! We can't wait to see your pictures on our Facebook page! Like these pictures from one of our 34 Weekers- I LOVE her children's rooms and am slightly, OK, a lot jealous of then!! Thank you Tonya, for letting me share! Out of the Dark. The name alone intrigued me, so of course I said yes to reviewing Mandisa's new CD, Out of the Dark. You see, I am no stranger to the dark. Is anyone? Even as someone who has walked with God for a quite a while, there have still been times of darkness in my life, the last few years in particular. And while, like Mandisa, I have allowed God to pull me back closer to Him, there were dark times, none the less. A loss of a child. Struggles exist in all forms. And no one is immune. Certainly not believers. Those struggles are what inspired Mandisa's newest CD, Out of the Dark. Each song was written in response to the personal tragedy of losing a close friend to cancer and the faith struggle that followed. In a beautifully written tribute in the CD, Mandisa talks of her loss, her struggle with God, her dry period of faith, and how eventually God used her friends and family to draw her back to the Lord. It is beautifully written and worth the read. It is a reminder that we are not alone in our struggles and that even those with great faith can stumble along the way. A reminder that we too must be the hands and feet of Jesus. That God uses everyday people to do extraordinary work. On the Out of the Dark CD you will find 15 new songs and three bonus songs, written four years after Mandisa's hit song, Overcomer. Most are pretty upbeat tempos, in typical Mandisa style, though a few are slower. ALL have beautiful, heartfelt lyrics which can also be found printed in the CD case. Let me tell you though, one of the things that stuck out to me the most was the opening track in which Mandisa shares a few voice recordings of friends who left messages on her phone reaching out to her. Oh, friends, never underestimate the power God gives you to touch other peoples' lives and speak truth into them. God's Word is sufficient, but the bonds of friendship are sometimes what it takes to reach a hurting soul with that Word! While my old fashioned self does love the old fashioned hymns that simply praise God, I do acknowledge that different kinds of music can speak to different people. If you like a more upbeat style of Christian music you are going to like this CD! The tunes are catchy, the words are uplifting, and there is no doubt that the heart behind the songs is one that loves the Lord and seeks to praise Him. Our friends at FlyBy Productions are offering a Out of the Dark CD to one of our readers! Just leave me a comment and a way to reach you if you win and we will draw a random winner's name next week! You can watch the story behind the music HERE! OK, first things first! I just want to state for the record that I am relying mostly on my boys for this review. Not because I did not like Captain Absolutely from Focus on the Family , but rather I had a hard time finding it for the past 6 weeks. That is because my boys, ages 9 and 15, took off with the book as soon as it arrived on my door step and have since been passing it back and forth between them. What's a mom to do? Here's what is neat about it. Well, there are a lot of things, but let me start with this. Salem is 15 and grew up on Focus on the Family and Adventures in Odyssey. He recognized the name Captain Absolutely immediately and told us all about it. For him, it was fun to revisit old memories of fun times. Colby, age 9, on the other hand, was not familiar with the character, but loved the comic book format. He was drawn in by the colorful pages and obvious action! So who is Captain Absolutely? This unlikely hero was originally featured in an Adventures in Odyssey series that began in the Clubhouse Magazine. After being thrown by a radioactive explosion into a mysterious room containing forbidden Bibles, Josiah learns the truth about God and becomes the super hero, Captain Absolutely. A battle ensues against Dr. Relative and the adventure and excitement begins. As he fights each new villain, Captain Absolutely sees how sin corrupts the world and learns what the Bible says about Truth. Why do we love this book?- I have to admit, comic books are not my thing. I have a hard time knowing what part to read next and get lost easily. However, that is NOT the case for my boys. They love the comic book format. I love that the pictures are bright and engaging and hold the interests of my busy boys! But most of all, I am thrilled that they are reading a book that is not only entertaining, but speaks about God and His truth. Quite frankly, that kind of book is hard to find these days. Books stores are lined with a whole lot of books with very little inside them but trash. As my mom used to say, "trash in, trash out!" Does God love bad people? These questions and many more listed are great starting points for discussion. I would recommend this book for late elementary students who are good readers and up, though I suspect middle schoolers will enjoy it most. It is also infused with wit and humor, sure to entertain! 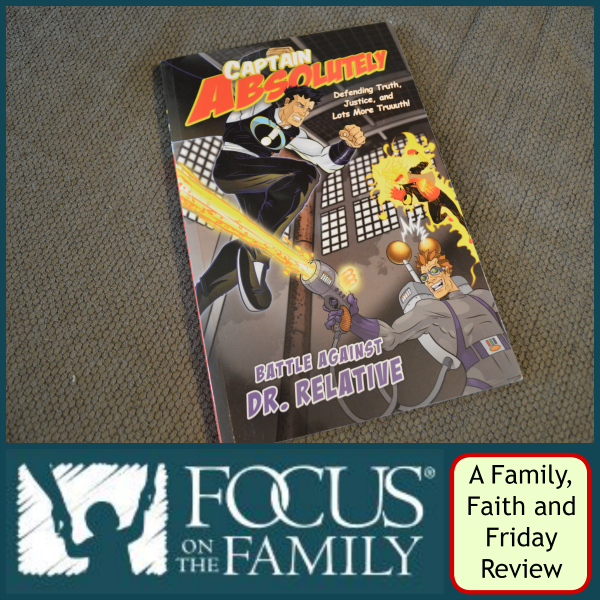 As with my oldest, it is also a fun read for those of you who have older kids who have grown up on the Adventures in Odyssey series. We are hoping another volume will soon follow!